Disclosure statement: David Kanter is the Vice-Chair of the International Nitrogen Initiative. Nitrogen pollution is produced by a number of interlinked compounds, from ammonia to nitrous oxide. While they have both natural and human sources, the latter increased dramatically over the past century as farmers scaled up food production in response to population growth. Once these chemicals are released into the air and water, they contribute to problems that include climate change and “dead zones” in rivers, lakes and coastal areas. Reducing nitrogen pollution around the globe is an urgent environmental goal, but extremely challenging – in part because the main human source is agriculture. Environmental policies are especially hard to enforce on farms because there are many of them over broad areas, which makes it difficult to confirm that farmers are complying. And powerful agricultural interest groups often push back against them. Even for farmers who want to do a better job, managing nitrogen use is challenging. Nitrogen is a key nutrient that helps plants and livestock grow, but it escapes readily into the environment. 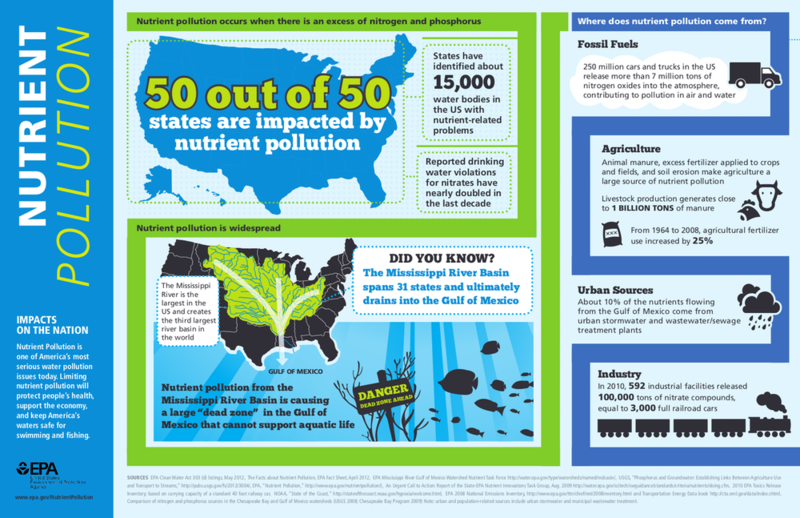 My research focuses on nitrogen and its many environmental impacts. In a recent study, Princeton University research scholar Tim Searchinger and I lay out a new strategy that targets fertilizer companies as well as farmers. It draws from the example of U.S. fuel efficiency standards, which reduce fuel consumption by regulating a relatively small group of large car manufacturers instead of more than 200 million drivers. Nitrogen is essential for producing food, but about half of the nitrogen used in the global agricultural sector – from fertilizer applied on fields to manure stored in lagoons – is either emitted to the atmosphere or washed off into local waterways. These losses stem from how farmers apply nitrogen and in what forms. Consequently, most nitrogen management policies are designed to give farmers incentives to change their behavior – for example, by developing nutrient management plans or using more environmentally friendly fertilizers that delay the release of nitrogen into soil. However, this approach has had little effect. At the national level, adoption of best practices and technologies has remained stagnant since the mid-1990s, while nitrogen pollution levels have increased . To get past this impasse, we looked for approaches that go beyond the farmer. Analyzing past environmental policies, we identified two conditions that increased the chances of success. First, policies tend to be more successful when they target sectors in which a small number of actors control a majority of the market, which makes monitoring and enforcement easier. The United States has 2.1 million farms spread over 900 million acres, so regulating nitrogen use at the farm level is not an efficient approach. Second, we found that the likelihood of success increases dramatically if the regulated actors can profit from being regulated – for example, because they produce patent-protected alternatives to the product that is being controlled. The 1987 Montreal Protocol, which phased out chlofluorocarbons (CFCs) because they depleted Earth’s stratospheric ozone layer, is a good example. Chemical manufacturer DuPont controlled a quarter of global CFC production when the treaty was negotiated, but supported the agreement because it also had patents on at least two generations of CFC alternatives. In other words, the policy created a global market for a new set of products. We believe a similar dynamic exists for the North American fertilizer industry. Current ideas for using nitrogen more efficiently focus on getting farmers to use new techniques and tools, such as sensors. Five companies currently control over 80 percent of North American production capacity for urea, an inexpensive form of nitrogen fertilizer, and ammonia, the main ingredient for all types of nitrogen fertilizers. Four of these companies either produce a more environmentally friendly fertilizer or provide a service to help farmers use nitrogen more efficiently. But these greener offerings occupy a very small niche in the fertilizer market. For example, Nutrien, which makes the most popular environmentally friendly fertilizer, Environmentally Smart Nitrogen, devotes less than 5 percent of its nitrogen production capacity to this product. Nor are these options widely used by farmers. Effective nitrogen management policies could boost demand for these products and services. They also could stimulate development of new technologies better suited to specific crops and climates, which would represent important economic opportunities for the fertilizer industry. To understand what an industry-focused approach might look like, we turned to U.S. corporate average fuel efficiency (CAFE) standards. CAFE regulations, which were introduced in response to high gas prices during the 1973 Arab oil embargo, require motor vehicle manufacturers to meet rising fuel efficiency targets over time, measured in miles per gallon for new vehicles. Instead of forcing over 200 million drivers to limit their mileage, this approach targets car manufacturers and ensures that the U.S. vehicle fleet becomes more fuel-efficient over time. The Trump administration is currently seeking to freeze CAFE standards instead of implementing an increase negotiated under President Obama, but it is not contesting the basic idea of making manufacturers responsible for vehicle fuel economy. This approach could be applied to fertilizer in at least two ways. First, suppliers could be required to increase sales of more environmentally friendly fertilizers as a percentage of total sales. Second, their products could be required to achieve a specific performance level where more nitrogen is available to crops rather than lost to the environment. Both approaches would share the burden of improving nitrogen management across farmers and the fertilizer industry. They also would give manufacturers incentive to develop more effective options. We evaluated how such an approach could work on 25 million acres of U.S. corn farmlands where nitrogen application rates are especially excessive. To estimate potential impacts, we compared three policy scenarios that required farmers to use environmentally friendly forms of nitrogen for either 12, 30 or 50 percent of their total applications by 2030. In our most ambitious scenario, we calculated that farmers’ fertilizer costs would rise. However, this increase would be more than offset by higher revenue from increased corn yields, leading to total nationwide gains of US $300 million by 2030. Industry profits would increase by over $150 million during the same period due to increased sales of more environmentally friendly fertilizers, which generate higher profit margins than traditional fertilizers. And the policy would produce $8 billion in environmental benefits by 2030 due to avoided damage costs from nitrogen pollution, dwarfing the impacts on farmers and industry. It would make sense to test a CAFE-style approach at the local or state level. California, which has already adopted ambitious climate change goals – including mitigating greenhouse gas emissions from agriculture – could be a potential test bed. There is no easy solution for curbing nitrogen pollution, given the diversity of agricultural, climatic and political systems across the world. Nevertheless, as the challenge worsens and world population grows, it is urgent to explore all policy options, especially approaches that could stimulate technological change and address a variety of environmental threats more quickly.